As the 2016 suite of new car models makes evident, electric vehicles are finally gaining real traction in the market. At the turn of the 20th century, more than one quarter of all cars in the United States were electric, yet the electric car had all but vanished by the 1920s. This disappearance was largely due to the insufficient range and power of electric car batteries compared to gasoline engines. Furthermore, electric cars were significantly more expensive than their gasoline counterparts. These same complaints are still heard today, even though battery technology has certainly improved over the last century. Much research and development is being done on battery technology to improve performance while ensuring that batteries are lightweight, compact, and affordable. So, what are the newest innovations in battery technology, and what do such advances mean for the electric vehicle market? Lithium-ion batteries (LIBs) are currently used in the majority of electric vehicles, and it’s likely that they will remain dominant into the next decade. Several manufacturers, including Tesla and Nissan, have invested heavily in this technology. 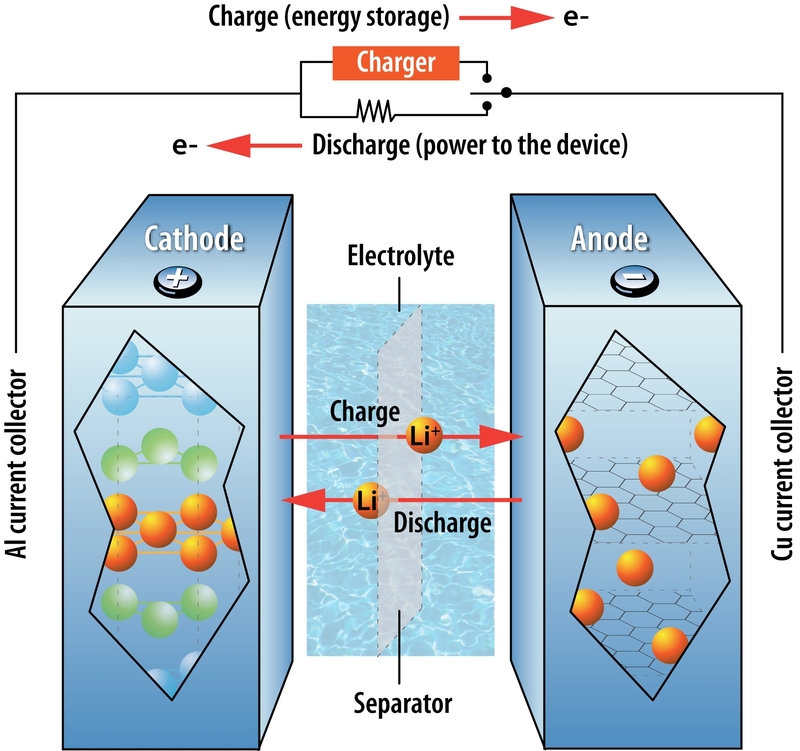 In LIBs, positively charged lithium ions travel between the anode and the cathode in the electrolyte. LIBs have a high cyclability – the number of times the battery can be recharged while still maintaining its efficiency – but a low energy density – the amount of energy that can be stored in a unit volume. LIBs have garnered a bad reputation for overheating and catching on fire (e.g. Boeing jets, Tesla cars, laptops), so manufacturers have not only worked to make LIBs more stable, but they have also developed many safety mechanisms to prevent harm if a battery were to catch fire. The LIBs on the market today primarily use graphite or silicon anodes and a liquid electrolyte. A lithium anode has been the holy grail for a long time because it can store a lot of energy in a small space (i.e. it has a high energy density) and is very lightweight. Unfortunately, lithium heats up and expands during charging, causing leaked lithium ions to build up on a battery’s surface. These growths short-circuit the battery and decrease its overall life. Researchers at Stanford recently made headway on these problems by forming a protective nanosphere layer on the lithium anode that moves with the lithium as it expands and contracts. Movement of lithium ions and electrons in a lithium-ion battery during charging and use. Source: Argonne National Laboratory. Used under Creative Commons license. Solid-state batteries have solid components. This construction provides several advantages: no worry of electrolyte leaks or fires (provided a flame-resistant electrolyte is used), extended lifetime, decreased need for bulky and expensive cooling mechanisms, and the ability to operate in an extended temperature range. Solid-state batteries can build off of the improvements made in other types of batteries. For example, Sakti3 is trying to commercialize solid-state, LIBs with funding from General Motors Ventures. Other auto manufacturers, such as Toyotaand Volkswagen, are also looking into solid state batteries to power their electric cars. Aluminum-ion batteries are similar to LIBs but have an aluminum anode. They promise increased safety at a decreased cost over LIBs, but research is still in its infancy. Scientists at Stanford recently solved one of the aluminum-ion battery’s greatest drawbacks, its cyclability, by using an aluminum metal anode and a graphite cathode. This also offers significantly decreased charging time and the ability to bend. Researchers at Oak Ridge National Laboratory are also working onimproving aluminum-ion battery technology. Lithium-sulfur batteries (Li/S) typically have a lithium anode and a sulfur-carbon cathode. They offer a higher theoretical energy density and a lower cost than LIBs. Their low cyclability, caused by expansion and harmful reactions with the electrolyte, is the major drawback. However, the cyclability of Li/S batteries has recently been improved. Li/S batteries, combined with solar panels, powered the famous 3-day flight of the Zephyr-6 unmanned aerial vehicle. NASA has invested in solid-state Li/S batteries to power space exploration, and Oxis Energyis also working to commercialize Li/S batteries. Metal-air batteries have a pure-metal anode and an ambient air cathode. As the cathode typically makes up most of the weight in a battery, having one made of air is a major advantage. There are many possibilities for the metal, but lithium, aluminum, zinc, sodium remain the forerunners. Most experimental work uses oxygen as the cathode to prevent the metal from reacting with CO­2in the air, because capturing enough oxygen in the ambient air is a major challenge. Furthermore, most metal-air or metal-oxygen prototypes have problems with cyclability and lifetime. Batteries are often underappreciated when they work as designed, but harshly criticized when they don’t live up to expectations. The technologies highlighted above are by no means an exhaustive list of the developments that have been made. Electric vehicles will undoubtedly become more commonplace as batteries are improved. Advancements in batteries could not only transform the transportation industry, but they could also significantly affect global energy markets. The combination of batteries with renewable energy sources would drastically diminish the need for oil, gas, and coal, thereby altering the foundation of many economic and political norms we currently take for granted. We certainly don’t have to wait until the “perfect battery” is developed to recognize tangible improvements in performance. Despite the current shortcomings of batteries, the potential global impact that even relatively moderate improvements can have is astonishing. Elsie Bjarnason contributed to this blog post. Cycles need to be improved – Lithium batteries typically have a charge/discharge life cycle of 300 to 500 before they “die”. Density needs to be increased – The more energy you can store in a battery, the smaller and lighter you can make the appliance that carries the battery. Since we first started writing about lithium battery technology startups, there have been a few notable acquisitions. Vacuum maker Dyson acquired Sakti3 which was working on solid state batteries. If you recall, solid state batteries eliminate the need for an electrolyte which means they are safer and cheaper to manufacture. Another battery technology startup called Seeo was developing solid state batteries based on a nano-structured polymer electrolyte. Seeo was acquired by Bosch in August of 2015. Both of these acquisitions show promising possible exits for other lithium battery technology startups. We had some of our on-staff PHDs try and put together a list of lithium battery technology startups to watch and here’s what they found. China is expected to become a major player in lithium battery production by 2020 with a capacity increase of +521% between 2016 and 2020. Clearly Boston Power sees a future there that avoids having to compete directly with the Tesla Gigafactory. English startup Nexeon has taken in $108 million in funding so far to develop a unique silicon anode technology which uses nanomaterials that we won’t get into because that’s complicated, innit. Their drop-in approach means that you can just start using their new cathode in your current manufacturing process and cell capacity will increase by 30-40%. They have a fully automated pilot plant in operation at the moment and have recently expanded into Asia via Japan. Their last funding was a $38 million round last year which they plan to use for acquisitions. We talked about this Israeli company before which has taken in $66 million in funding and is using nanotechnology, specifically quantum dots, to create a battery that charges 100X quicker. The only issue they’re facing is that the technology requires the phone to attach directly to the charger (no wires) with a proprietary 20-pin connector. This means that you would need an entire ecosystem in place before the technology could be adopted. Nonetheless, the CEO and founder Doron Myersdorf believes that this is the year for a mass production launch. Founded in 2006, Irvine California startup Enevate has taken in around $60 million in funding so far to develop a silicon-dominant anode battery technology referred to as HD-Energy. Phone run tests show 35-50% more use time along with 4X faster charge time than conventional batteries. The Company is currently in negotiations with several original-equipment manufacturers of mobile devices to supply batteries for certain product lines. While initially targeting smartphones, the new battery technology is also expected to be used in drones and electric vehicles as well. We first wrote about Amprius way back in 2014, a California startup out of Stanford that took in $55 million to develop an anode made out of silicon nanowires. According to the Company, they are “currently designing and selling the highest energy batteries on the market, with 15-30% more energy per unit weight and volume than state-of-the-art batteries“. They also go on to say that “Amprius products are featured in a number of smartphones released in 2013 and 2014“. It seems like they’re pivoting into electric vehicles with their website stating “Amprius silicon nanowire anodes can improve the energy density of lithium-ion batteries by 1.4x to 10x, making them ideally suited for electric vehicles“. This Massachusetts startup is working on an ultra-thin metal anode that can double energy density while using existing lithium-ion production infrastructure. They’ve taken in $20.5 million so far to further those aspirations, and their 3 funding rounds so far included participation from General Motors. When Samsung had all those phones catching fire recently, SolidEnergy was quick to point out that they are using electrolytes which are not flammable. ActaCell, Inc. founded in 2007 is based in Austin, Texas, and was acquired by Contour Energy Systems in September 2012. Since the Contour Website isn’t functioning at the moment, we’re not sure if they’ve gone bankrupt or just have an incompetent hosting provider. ActaCell had raised a total of $9.8 million (of which $3 million was a grant from the Department of Commerce received in 2010) to develop cathodes made from magnesium spinel and anodes made from nanocomposite alloys. Prominent among its investors was none other than Google. Another startup out of Massachusetts called Cadenza Innovation has taken in $5 million in funding to develop a new way of packaging lithium batteries. The founder, Christina Lampe-Onnerud, was also the founder of Boston Power so she knows a thing or two about batteries. Cadenza has also received funding from the U.S. Department of Energy for a 4-year project that began back in 2014 to expand the range of electric car batteries by increasing energy density. Cadenza’s technology is a multifunctional battery pack design that costs less, has double the density, and can manage impact energy in the event of a collision. Massachusetts startup Ionic Materials was founded in 2011 by CEO Mike Zimmerman Ph.D., a proven serial entrepreneur who has more than 30 years of polymer expertise. The Company has taken in $4.29 million in funding (according to PitchBook) to develop a novel polymer that eliminates the liquid electrolyte, creating a completely solid battery. They plan to be in production in the next two or three years . They were recently awarded with a $3 million Advanced Research Projects Agency-Energy (ARPA-E) grant from the Department of Energy that will begin this year. Science Friday interviewed the company in this article in which the CEO is hopeful that “we’ll see devices supported by Ionic Materials’ plastic battery in two or three years“. Colorado startup Prieto battery has taken in $2.5 million in funding from investors that included Intel and Stanley Black & Decker (NYSE:SWK). The Company is working on a 3D lithium-ion battery technology that is price-competitive, charges faster, and lasts longer. Their batteries use no liquid electrolytes, and instead use a highly conductive copper foam that can be shaped to fit spaces that are inaccessible – like the sort of custom shapes you might need when creating an ergonomic power tool. We wouldn’t be surprised to see them get acquired by SWK. Mysterious San Jose startup QuantumScape has taken in an undisclosed amount of funding from investors that included Volkswagen, with the intent of developing a solid-state fireproof battery that can triple the range of its electric cars. The technology, which is being licensed from Stanford, was developed with a grant from the U.S. Department of Energy. QuantumScape continues to operate in stealth mode so if suddenly VW announces a vehicle that has triple the range of a Tesla, we’ll know who is behind it. Founded in 2004 with an undisclosed amount of funding, a UK-based startup called Oxis Energy is developing and innovating a Lithium-Sulfur (Li-S) battery chemistry. This chemistry is the reason why Oxis’ patented technology is safer, lighter, maintenance-free, and provides 5 times (1,500 cycles) greater energy compared to conventional Li-ion technology. Oxis batteries can withstand the most extreme abuse like nail or bullet penetration. The Company is in the process of building pilot manufacturing facilities. OneD Material was co-founded by Invention Capital Partners and a group of private investors who acquired Nanosys’ nanowire technologies and Palo Alto R&D activities for an undisclosed amount. Back in the day when nanotechnology first started to come to the attention of investors, Nanosys was expected to be a forerunner and actually came close to having an IPO. The OneD Material technology is a silicon-graphite anode material which improves the performance of lithium-ion batteries. Covered by more than 300 patents, their scalable SiNANOde™ production processes is available now for technology transfer and licensing. In researching this article, it was decided to exclude lithium technology startups like Brightvolt that are targeting thin film batteries for smaller applications like IoT or credit cards. That’s because the main interest is in lithium technologies that will increase the range of electric vehicles, help smartphones stay charged longer, and enable drones to fly over longer distances. Adoption of lithium batteries will only accelerate with a predicted reduction of battery prices in 2017 of at least 15% (after a 70% reduction in the past 5 years). With a few successful exits already, we can be assured that a new lithium battery technology from at least one of these startups will be powering a battery near you in the coming years. Think we missed a lithium battery technology company that’s targeting EVs/drones/phones? Drop us a line or a comment at Genesis Nanotechnology Inc.
Tony Seba, Silicon Valley entrepreneur, Author and Thought Leader, Lecturer at Stanford University, Keynote The reinvention and connection between infrastructure and mobility will fundamentally disrupt the clean transport model. It will change the way governments and consumers think about mobility, how power is delivered and consumed and the payment models for usage. Batteries, it seems, are everywhere these days, yet important questions remain about what kind of energy storage technologies are needed to help the U.S. meet its commitments to cut greenhouse gases and which areas of research are most likely to pay dividends by improving existing batteries or creating entirely new battery technologies. After exploring these questions for the past five years, Jessika Trancik, Associate Professor of Energy Studies with MIT’s Institute for Data, Systems, and Society, has found some answers that she will share at “Materials for Electrochemical Energy Storage,” the Materials Processing Center’s Materials Day Symposium on Tuesday, Oct. 18. The symposium will be held in MIT’s Kresge Auditorium, followed by a student poster session in La Sala de Puerto Rico, Stratton Student Center. “This year’s Materials Day workshop will focus on advancing materials technologies for electrochemical energy storage, as well as on new systems-level approaches to cost-effective integration of these devices in both large and small-scale power grids,” says Materials Processing Center Director Carl V. Thompson, who is the Stavros Salapatas Professor of Materials Science and Engineering at MIT. (continued) “In some locations, for example, some stationary storage technologies available today add profit to solar and wind, and that’s taking into account the lifetime of the project and so forth,” Trancik explains. “In the next few years, there is an opportunity to do that at low cost with relatively little subsidy needed.” However, as solar and wind prices continue to fall, storage technologies will also need to become cheaper if they are to continue to add value. Jessika Trancik, associate professor of energy studies at MIT, will present at the annual Materials Day Symposium. Trancik, whose input was solicited by the White House ahead of the 2015 climate change negotiations, notes that commitments to the Paris Agreement, if met, will likely lead to significant growth in intermittent solar and wind installations. She says the next 15 years are critical for storage technology development. “By 2030, we really need to have developed affordable and well-functioning storage technologies in order to continue to support the growth of solar and wind worldwide,” she adds. Similarly, with battery-based vehicles, such as the currently available Nissan Leaf, the outlook for converting a large portion of cars on the road from gasoline to electric looks promising. But, Trancik cautions, since electric vehicles have a shorter travel potential on a full charge than a gasoline car has on a full tank, a solution is needed for the 13 percent of cars on the road whose daily driving range would not be met. “There are a certain number of days during which the average driver will exceed that range. … People buy and own vehicles to get them where they want to go on all days, not just 87 percent of days,” Trancik says. Some type of convenient, on-demand car sharing or other ways to meet these needs are critical, she suggests. • Martin Z. Bazant, professor of chemical engineering and applied mathematics at MIT. Bazant, who is executive officer of chemical engineering as well as professor of mathematics, will present his recent work on lithium-ion, lithium-air, and lithium-metal batteries. Recent findings in Bazant’s group uncovered two different ways that lithium deposits grow on the surface of lithium metal electrodes and showed how to effectively control destructive lithium filament growth at lower power levels.